We’ve all experienced that uncomfortable ache in the lower or upper back from time to time. Back pain is relatively common and can be caused by a variety of scenarios—sleeping the wrong way, sitting at a poorly configured work space all day, or just plain old aging— but while back pain is common and there are many reasons why we may experience it, it shouldn’t be constant. Many times, we attribute back pain to “being on my feet for too long” or “not wearing the right shoes”, but our bodies are naturally designed to withstand being on our feet for extended periods of time. While we’re not suggesting you perform 8 hours of manual labor in heels, we are suggesting that there may be an underlying reason to back pain—talotarsal displacement, or misaligned feet. How Can Misaligned Feet Cause Back Pain? To understand what it means to have misaligned feet, it’s important to first understand what it means to have aligned feet. When your feet are aligned,your ankle bone (talus) sits directly on top of your heel bone (calcaneus). The front edge of each bone is almost aligned with the other (the front edge of your ankle bone slightly overlaps the front edge of your heel bone) and there is a naturally occurring space in between, called the sinus tarsi. When your feet are misaligned, your ankle bone falls forward and out of line with your heel bone causing the sinus tarsi to close/collapse, as seen in the video below. When this space collapses it causes your entire body to be out of alignment and puts excess strain on other portions of your body, including your back. Your spine is being forced to compensate for the misalignment in your feet. HyProCure is a small titanium stent that is inserted into the sinus tarsi—no pins, screws or drills required. This repairs the misalignment at its root by keeping the sinus tarsi in an open stable position. This stops your ankle bone from sliding forward and off of your heel bone and keeps the rest of your body in its natural alignment. Problems from back pain are among the most common physical complaints of adults. In fact, it is estimated that there are over 1,000,000 back surgeries performed every year in the United States alone, with the leading complication being recurrence. HyProCure has the ability to correct certain back issues at their source without painful, invasive reconstructive surgery and a long healing process. Find out more about how HyProCure can help relieve your symptoms. 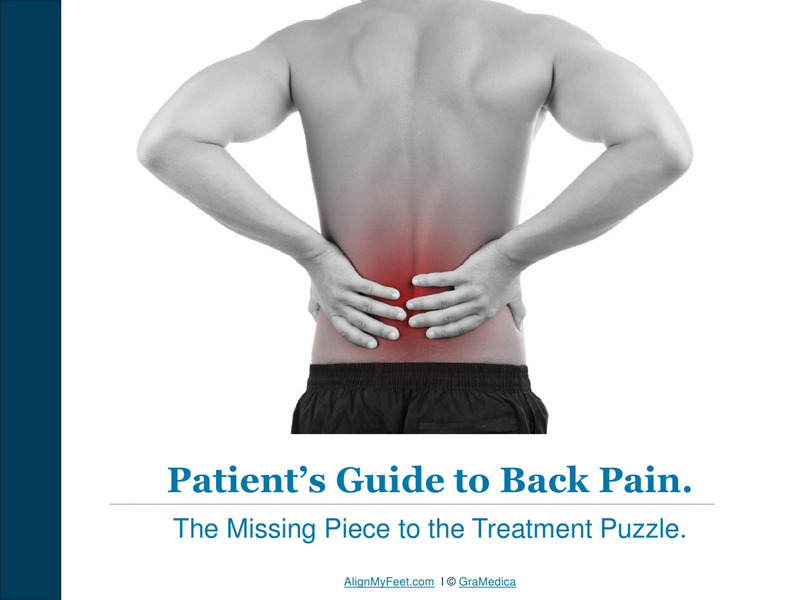 Get Your Free Patient’s Guide to Back Pain Today!